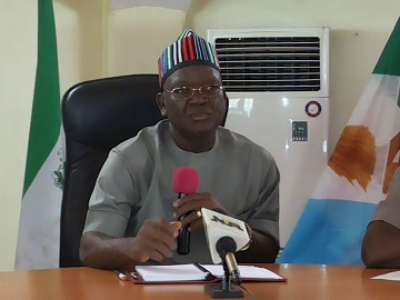 Benue State Governor, Dr. Samuel Ortom, has given assurance that his administration would provide social amenities to all section of the state irrespective of whether they supported him during the election. The governor gave the assurance when he and his wife, Eunice, hosted a delegation of Isherev Women Association in Markurdi. Ortom, who stated that he harboured no grudge against anybody that worked against his ambition, sued for the support of members of the opposition to enable his government realise its dreams of lifting Benue out of poverty, disease and ignorance. The governor thanked the Isherev Women Association, who voted for their son, Prince Terhemen Tarzoor, for retracing their steps to support his government and expressed the willingness to assist in improving their economic status. In her remark, wife of the governor, Dr. Eunice Ortom, thanked the women for the honour and requested them to forward the names of under privileged children in their communities to enjoy the scholarship scheme of her foundation. Earlier, President of Isherev Women Association, Mrs. Christiana Ugber, who spoke through the Secretary, Mrs. Margaret Jirja, appreciated the governor for facilitating the establishment of a cargo airport in Daudu and keeping their sons and daughters in his government. Mrs. Ugber, however, appealed to Ortom to provide them with fertilizer and empower their children whom she said have graduated but are without jobs for a long time. In another development, the governor has acknowledged the contributions of the private sector in developing the Benue child through the provision of quality education. He made the acknowledgement when the Parent Teachers Associatioand Caring Mothers of Towering Tots Nursery and Primary School visited him. The governor’s wife, who expressed happiness that products of private schools were making the state proud, said already a special grant had been set aside in the budget to support them to do more. BENUE State Governor Samuel Ortom has expressed appreciation to members of the Strategy Committee that drafted his blueprint, “Our Collective Vision For A New Benue.” for charting the direction of his administration. Speaking while hosting the committee at the New Banquet Hall of the Benue Peoples House, he pledged to remain focused on the implementation of the document. Committee chairman and Education, Science and Technology Commissioner, Professor Denis Ityavyar, said many members of the committee have been involved in government and therefore, could facilitate the implementation of the vision document. Vice Chairman of the Committee and Vice Chancellor of Kwararafa University, Professor Yakubu Ochefu, stated that it was the first time in the history of the state that a governor would host those who drafted his blueprint. The highpoint of the event was the decoration of the chairman, vice chairman and Mrs. Mkeryi Amahson, a committee member, in Benue traditional fabrics.